Western blot analysis of extracts from HeLa cells, serum-starved overnight and either untreated or H2O2-treated (4 mM, 30 min), using Phospho-AP2M1 (Thr156) (D4F3) Rabbit mAb (upper) or β-Actin Antibody #4967 (lower). 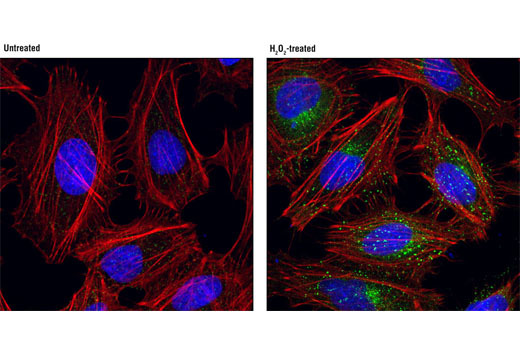 Confocal immunofluorescent analysis of HeLa cells, untreated (left) or H2O2-treated (4 mM, 15 min; right), using Phospho-AP2M1 (Thr156) (D4F3) Rabbit mAb (green). Actin filaments were labeled with DY-554 phalloidin (red). Blue pseudocolor = DRAQ5® #4084 (fluorescent DNA dye). 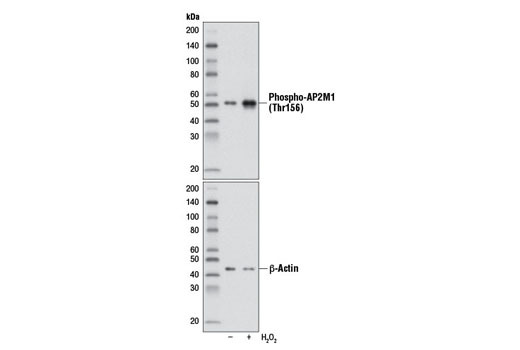 Phospho-AP2M1 (Thr156) (D4F3) Rabbit mAb recognizes endogenous levels of AP2M1 protein only when phosphorylated at Thr156. Monoclonal antibody is produced by immunizing animals with a synthetic phosphopeptide corresponding to residues surrounding Thr156 of human AP2M1 protein. The AP-2 coat assembly protein complex is an important component of clathrin-coated pits involved in receptor-mediated endocytosis at the plasma membrane (1-3). Each AP-2 heterotetramer is composed of α, β, μ, and σ protein subunits. The 50 kDa μ subunit (AP-2μ, AP2M1) is located at the core of the AP-2 complex and mediates interaction between the cargo protein and the clathrin-coated pit (1-4). The carboxy-terminal AP2M1 region recognizes the tyrosine-based, endocytotic sorting motif YXXφ found in cargo proteins and helps to bring the cargo protein to the clathrin-coated pit. Non-canonical, tyrosine-based endocytotic sorting signals can also promote interaction between cargo proteins and AP2M1 (5,6). AP2M1 plays an essential role in molecular signaling as it couples receptor-mediated endocytosis and pathways involving membrane receptors (7-9), matrix metalloproteinases (10), and ion channel proteins (11). Phosphorylation of specific AP2M1 residues and binding of lipids to this adaptor protein can regulate AP2M1 activity (12,13). Phosphorylation of AP2M1 at Thr156 by adaptor-associated kinase 1 (AAK1) stimulates affinity binding of AP2M1 to cargo protein signals (14). Kirchhausen, T. (2002) Cell 109, 413-6. Ohno, H. et al. (1995) Science 269, 1872-5. Traub, L.M. (2003) J Cell Biol 163, 203-8. Boll, W. et al. (1996) EMBO J 15, 5789-95. Royle, S.J. et al. (2002) J Biol Chem 277, 35378-85. Royle, S.J. et al. (2005) J Cell Sci 118, 3073-80. Chin, Y.R. and Horwitz, M.S. (2005) J Virol 79, 13606-17. Wernick, N.L. et al. (2005) J Biol Chem 280, 7309-16. Johannessen, L.E. et al. (2006) Mol Cell Biol 26, 389-401. Uekita, T. et al. (2001) J Cell Biol 155, 1345-56. Chen, Z. et al. (2006) Am J Respir Cell Mol Biol 35, 127-32. Höning, S. et al. (2005) Mol Cell 18, 519-31. Olusanya, O. et al. (2001) Curr Biol 11, 896-900.